A new episode of our podcast, the Tenkara Cast, is now available through your favorite podcast listening app, or right here on our website. This time Daniel chats with Chris Johnson about tenkara fishing in Texas. Things are coming together nicely for the 6th Tenkara Summit, which will take place in Estes Park on September 16th. This year we are counting on the presence of Dr. Hisao Ishigaki and Yvon Chouinard who will be speaking at the event, along with Adam Trahan, Jason Klass, Steve Schweitzer. In addition we’ll be featuring clinics and demos on fly-tying, casting and more. This is promising to be a great event, and we hope to see you all there! You can register for the Tenkara Summit here. Further details, such as the schedule, lodging, food, etc, on this page. After 7 years of introducing tenkara outside of Japan, I am ready to publish my book on tenkara. But, I need your help to make this the very cool project it can be. Would you please help me spread the word about this project and consider backing my Kickstarter campaign for tenkara – the book? A couple of months ago a friend turned me on to the app Storehouse. I immediately started playing with it as a story-telling medium and loved the format. The first story I created with images and videos I have captured was “Tenkara with Yuzo Sebata“. I intend to create a series of stories of fishing and learning from different tenkara teachers. Here’s my story of “Tenkara with Hisao Ishigaki”. Hope you enjoy it. The “One fly” concept of tenkara – in which it is observed that most experienced tenkara anglers in Japan stick with one fly and don’t change it all the time, and that just about any fly can work – is a difficult one for most people to embrace. It is also a concept that has sparked a fair amount of debate within the tenkara community; some of it by folks misinterpreting the message as “you must use one fly”. But really, all this concept brings to us is a different way of thinking about fly-fishing. It is just like tenkara, it brings us an entirely different way to think about fly-fishing. When I first learned that tenkara anglers in Japan were only using one fly pattern, it absolutely changed my fly-fishing life. It simplified it by telling me I could reduce my fly choices considerably. And it liberated me from second-guessing what fly to use and from consulting hatch books and locals for what flies I should use. And, that’s why I’m passionate about sharing this concept. Not for sake of purity or tradition, but because I have found it works. At least it works well enough to keep my life simpler and keep me from second-guessing my fly choices or worrying about what fly pattern *might* work a *little* better. I can not say whether one fly will always work, in fact I have been challenged and talked about that in this video. But over the last 4 years I have fished throughout the US and other countries with some of the most experienced anglers around, and to be honest have not yet seen a noticeable different in the numbers of fish caught. So, if you’re getting into fly-fishing or have been at it for decades, just know there is a different way to think about fly-fishing, fly choices and fly selection. You can ask yourself, is changing flies and second-guessing your fly choice worth the *possible* marginal benefit it brings over sticking with one fly pattern anywhere, anytime? 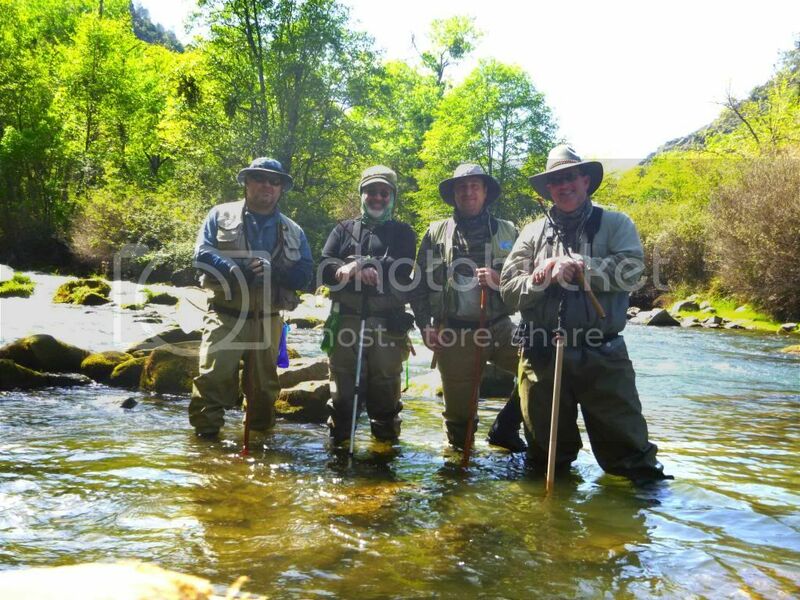 Had a great time this last weekend fishing with some of my tenkara friends. These are friends I have met in the last few years through tenkara and it was great to fish with all 3 of them for the first time. We already have a new trip planned soon but before that, I figured I would post some pictures that we have collected. The legendary fly-fishing author John Gierach is at it again with a new book fresh off the press: All Fishermen are Liars. Tenkara and Tenkara USA are featured in it as Gierach memorializes the time when I invited myself to come to Colorado and teach him tenkara. Over the weekend I caught up with Gierach in the writer’s den to talk about tenkara. Please, do yourself a favor and buy Gierach’s new book! We will be contacting you guys shortly via email! THANK YOU ALL OF OUR READERS FOR THE WONDERFUL COMMENTS YOU TOOK THE TIME TO ENTER HERE!!! We are super proud to have touched so many lives and hear from you about what tenkara has meant to you over the last 5 years. We will always make it right by you by continuing to provide great customer service, useful information, entertaining stories, and excellent products. .